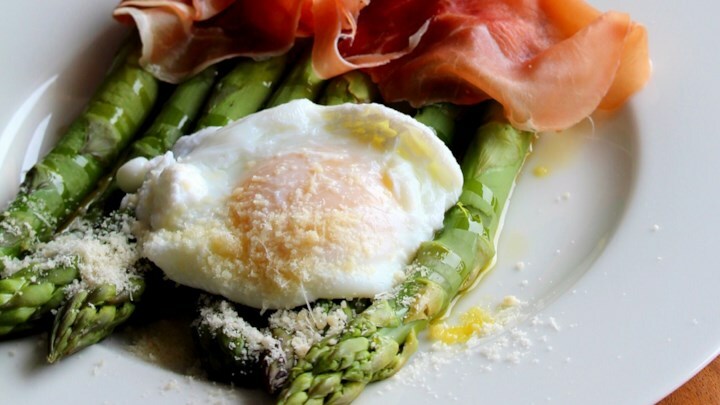 Prosciutto in unusual company - you will love this one! Step 1 Preheat oven to 425 degrees F (220 degrees C). Place asparagus in a baking dish and drizzle with 1 tablespoon extra-virgin olive oil. Step 2 Heat 1 tablespoon olive oil in a skillet over medium-low heat. Add prosciutto; cook, stirring, until golden and rendered, 3 to 4 minutes. Sprinkle prosciutto and oil over asparagus. Season with black pepper and toss to coat. Roast in the preheated oven for 10 minutes. Toss and return to oven until firm yet tender to the bite, 5 minutes. Step 3 Fill a large saucepan with 2 to 3 inches of water and bring to a boil over high heat. Reduce heat to medium-low, pour in vinegar and pinch of salt. Crack an egg into a bowl then gently slip the egg into the water. Repeat with remaining eggs. Poach eggs until whites are firm and yolks have thickened but are not hard, 4 to 6 minutes. Remove eggs from water with a slotted spoon, dab on a kitchen towel to remove excess water, then transfer to a warm plate. Step 4 Drizzle asparagus with lemon juice. Transfer asparagus to plates, top with poached egg and pinch of lemon zest. Season with black pepper and serve.